Dr. Ghaleb A. Husseini graduated with a PhD in Chemical Engineering (Biomedical Engineering emphasis) from Brigham Young University in 2001. 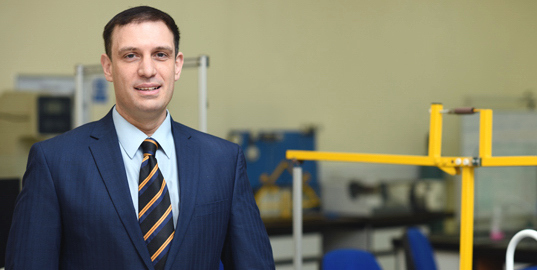 He joined American University of Sharjah as an assistant professor in the Department of Chemical Engineering in January 2004, and was promoted to associate professor and professor in 2008 and 2013, respectively. Dr. Husseini spent a sabbatical at the Ecole Polytechnique Fédérale de Lausanne (EPFL) working in Dr. Jeffrey Hubbell's laboratory. Dr. Husseini works in the area of ultrasound-activated drug delivery. His research involves sequestering chemotherapeutic agents in liposomes, micelles and other nanoparticles. The contents of this drug delivery system can then be released using ultrasound (US). This way the drug has minimal interactions with the healthy cells in the host body, and it can carry out its therapeutic effect at the sonicated cancerous region only and reduce the undesirable side effects associated with chemotherapy. He established the Drug Delivery Laboratory at AUS using an internal grant. Dr. Husseini has published 94 journal articles, two book chapters, a patent (and 1 filed) and 50 conference papers/abstracts, and has given 20 keynote/invited lectures. In addition, he was a theme editor for a special issue in Advanced Drug Delivery Reviews and is currently serving on the editorial board of the International Review of Applied Sciences and Engineering (IRASE) and the European Journal of Nanomedicine (EUJNM). He was elected into the IEEE-EMBS Distinguished Lecturer Program (January 2014-December 2015). His project entitled "Nanocarriers and Ultrasound in Cancer Treatment" was highly commended as Institute of Chemical Engineers (ICHEME) Research Project of the Year - ICHEME Global Awards 2016. He was awarded the Excellence in Teaching Award for the AUS College of Engineering in 2014 and the Excellence in Research Award for the same college in 2016. He won the TIP (Technology Innovation Pioneer) Health Care award in 2018.